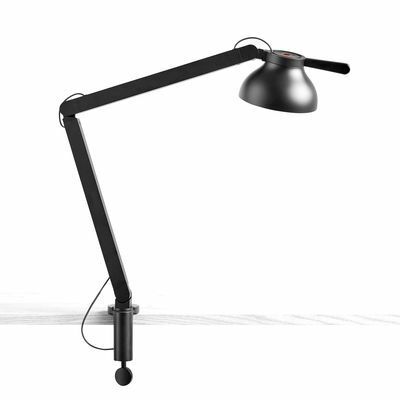 Famous French designer Pierre Charpin is expanding his collection of ''PC'' light fittings with this architect’s lamp with its clamp base. 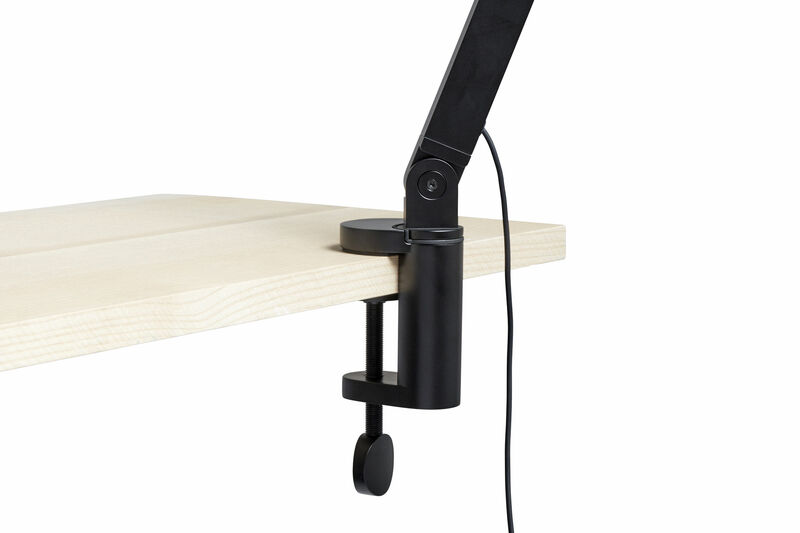 It attaches to any horizontal surface with a thickness of 5.5 cm maximum. You can easily fix the lamp to a shelf, desk, table or a console... 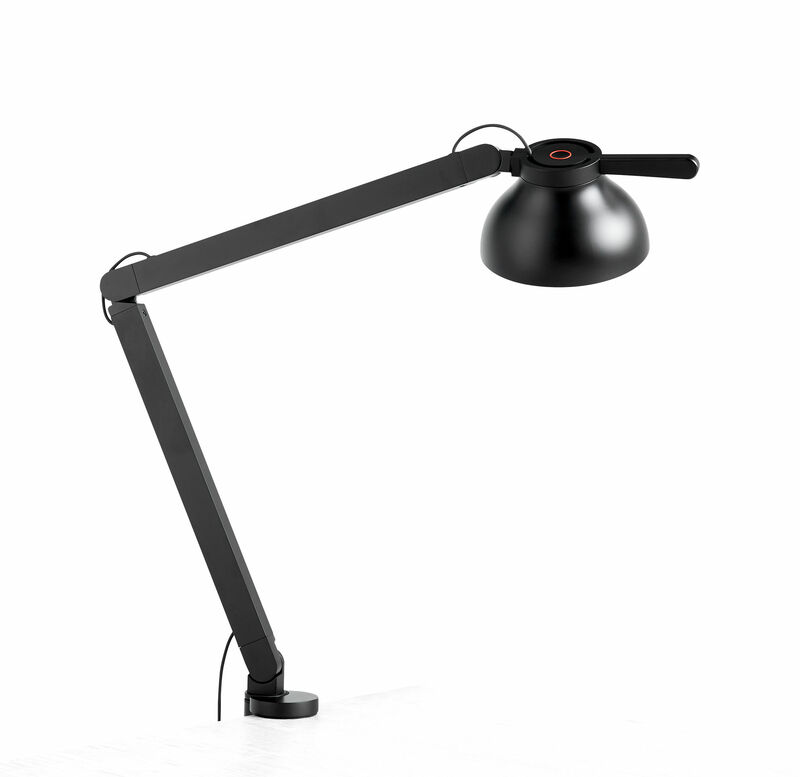 It took more than three years of research for Pierre Charpin to develop the PC lamp. Very simple and visually refined, it was complex to design and produce because it incorporates cutting-edge technology. The arm and lampshade are articulated using a sophisticated system of gas pistons, generally used to adjust the height of office chairs. These high-tech joints provide perfect arm and lampshade stability in any position with great precision. The handle on the lampshade makes it easy to operate. The head of the PC lamp is equipped with a sensitive dimmer with memory function that records the last level of brightness used. A true quest for simplicity, PC’s restrained design fits in with all environments. The various elements are made of different materials (polycarbonate lampshade, aluminium arm, ABS base) but are visually united by a monochrome colour. Designer Pierre Charpin explains: "I often talk about sensuality in design. I wanted this lamp to be more sensual than technical, to make the object less demonstrative and more user-friendly. At the time Hay was developing its first lighting collection, we worked on the PC lamp project with the common desire to offer a sophisticated, affordable product. As a designer, I want to design objects that can easily cross the border between home, office, public space, indoors and out. The PC lamp is a fine example of this limitless vision of design. What interested me was to see the lamp as a presence, as part of the domestic landscape. I wanted the object to be legible as a whole. In French, I would say "a silhouette".